Heavy duty wire shelves are used for high density storage and heavy load storage applications. These shelving systems are designed to convert the maximum amount of vertical and horizontal cube space into usable, efficiently organized storage space. There are many features of wire storage systems that make them ideal for storing all types of materials and products. To begin with, wire allows for a free circulation of air around stored items. When storing perishable products, product life is extended this way. Light can also penetrate through the shelves, so it is easier to see products without the added expense of special lighting. Wire does not catch on fire, so fire hazard is also minimized with its usage. Ttypically, any given shelf in one of these units is going to be capable of supporting anywhere from 600 to 800 lbs of weight. Depending, then, on how many of these shelves are used in a unit and what types of vertical supports are used to house the shelves, heavy duty wire shelving systems can easily hold up to 1500 lbs of total product weight. Almost any business in today’s marketplace has a need for this type of storage system. Warehouses rely on heavy duty wire shelving because it is one of the most efficient and cost effective methods of transforming huge sectors of empty space into working storage space. Factories can often save money using shelving units because they can store raw materials near production areas without having to lease or build out separate storage rooms. Offices also use heavy duty wire shelves in closets to store office supplies, IT components, and paperwork. Efficiently consolidating space like this can potentially save a company thousands of dollars a year that would otherwise be spent on larger offices with special and more expensive storage areas. Some companies even use shelving along the walls to make use of every square inch of floor space so they do not have to move to a larger facility. One place where we never fail to see wire shelf systems either on the floor or in the storage room behind the showroom is the retail industry. Retailers absolutely must have these systems to efficiently manage bulk quantities of inventory. There is even a growing trend among homeowners to use metal wire shelving to better organize garages and outdoor workrooms. Because of the wide range of vertical markets and environments they service, heavy duty wire shelves are made in many different designs. Cantilevered shelves mount directly to the wall, turning it into instant storage space. Dunnage systems are very common in the warehousing and restaurant business. These systems are simple wire frames that have a mid-level shelf and a bottom shelf for heavy duty storage. Sliding track systems are built with bearings in the skate underneath each post. Every unit has a load capacity of 1,500 lbs. The V-groove floor track allows the shelving unit to slide back and forth easily. Heavy duty wire shelves are also made from many different types of materials. 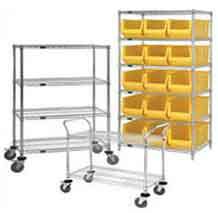 Units made from a nickel base that are subsequently plated with chrome are ideal up-front storage or material handling environments. Stainless Steel units are protected by an electropolish finish that resists corrosion. They are very useful in heavily polluted industrial areas in port cities like Houston located near salt water. Proform shelving is made from a type of carbon steel is that is treated with an iron phosphate base. A hybrid epoxy containing an antibacterial agent is then electrostatically applied. This type of wire shelf storage system is ideal for facilities located in high humidity climates where exposure to the elements is imminent.